Rotaryengine.com has been operating under its sister company RX7 Specialties which is the name of our service shop. 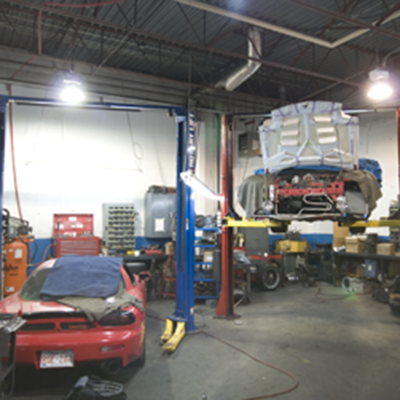 RX7 Specialties has been servicing Calgary and western Canada since 1994. The shop has been located at our current address for 19 of those 22 years and this shop sees more rotary engine cars then any other shop in Canada. With a local client base of 640 different cars and a total customer list of over 2200 different owners Canada wide we are proud of who we are. We perform all mechanical services including regular servicing and maintenance, performance work and engine building for all rotary cars. RX7 Specialties has been performing rotary engine replacements since day 1 and we not only continue to do more engine replacements then anyone else in Canada but we offer engine replacements for the RX8 also. Our RX8 Renesis engines are upgraded with stronger, longer life components yet still cost less then a Mazda re manufactured engine. Our engines have become so popular that some Mazda dealership service departments are offering them to their own RX8 customers. The engine rebuilding and in house engine replacements became so popular back in the mid to late 1990's, that's when RX7 Specialties spawned Rotaryengine.com... Our mail order engine exchange and parts program. To date the engine building and exchanges has grown to be the biggest part of what we do at our shop location. But we still service, modify and customize rotary cars every week and remain to be always busy with our customer's cars. RX7 Specialties continues to out perform the local Mazda dealers and yet we often maintin to be half the price. Our hourly rate is only $95.00/hour, but we usually package priceo ur jobs, and charge actual labour rates. So with the savings on parts combined with our cut rate labour charges we have never had one complaint about high labour cost so common in the marketplace. Customers often express they thought we would be more expensive because we specialize, simple answer we give them is always the same. NOPE! It's the other way around, we are actually far less than any shop or dealership in town. Please feel free to come down and pay us a visit, or call anytime for a free quote or some rotary car advise. © RX-7 Specialties LTD. All Rights Reserved.